On Friday we started saying goodbye to the D2 students. This was the last official day of classes for them and as they left they were cheered out by all the younger students. The afternoon continued for them with a celebration at the pool area with a lunch and roast of fellow students and others. Finally, they joined other students in a Student Council organized color day which included colored dye and a lot of water. I must say that as we had finally seen the sun at that point, it was a fun filled day. The D2 students also expressed their thanks for the community in an appreciation board filled with their sentiments of teachers and staff. While Friday marked the end of classes, over the next month the D2 students face their last hurdle in their exams ending on May 18th. 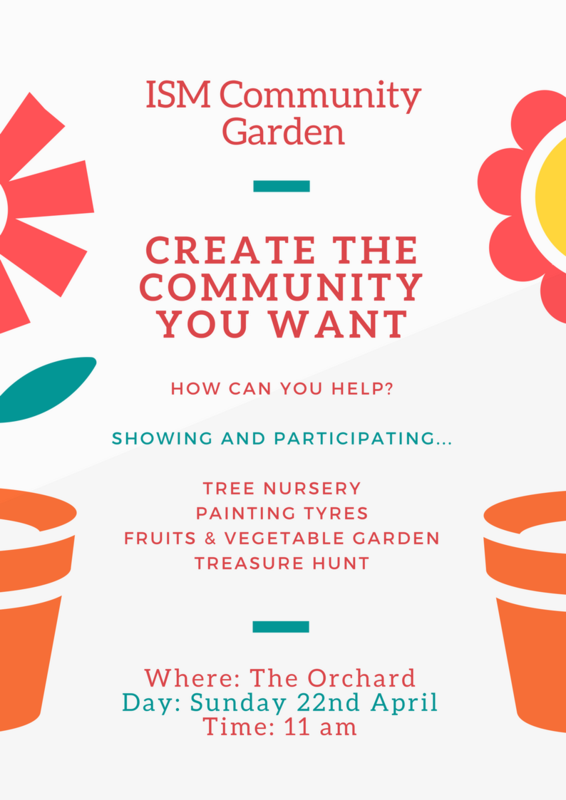 From farewells to new beginnings, on Sunday at 11am we will be starting the work required to transform the orchard area into a community garden. A lot of behind the scenes work has already started, but we would like your help in this new project. This week, on Thursday the 26th and next Tuesday on May 1st we have public holidays with no classes. A huge thank you to everyone who came to donate blood for KCMC Hospital on Friday afternoon. Thanks to the wider ISM and KCMC community we collected 35 bags of blood. If you consider that each bag can be used for three patients, this has a big impact. Our next blood drive will be around September and will be a longer event for more opportunity to donate. The D2 students celebrated their last day of official classes with a ‘clap-out’ (younger students cheered/clapped for them as they processed out of the tuition block for a special lunch gathering) in advance of their 3-weeks of IB DP official exams starting on Friday April 27th. A great photo was taken at the playground before they processed to a fun afternoon at the pool. The D1 students had a challenging week including advancing on coursework assignments, their TOK essay, Science laboratories and unit assessments. Plans for the D2 graduation weekend continue to evolve favorably and ISM will photograph and video record the event for parents. Hence, D2 parents are advised not to hire any photographers or videographers as they will not be allowed into Karibu Hall during graduation to avoid awkward situations that occurred at past graduations. The D1 students will have their end of year 2-hour exam in each subject starting on Thursday May 25th and finishing on Tuesday May 29th. Parents should plan ahead to attend the important parent-teacher meeting on Thursday June 14th. As part of examination skills training, the M4 will take end year examinations from May 24-29 in all subjects except in Arts, PHE, Design and Life Skills. The examinations will be from May 8 through May 18. Students received the Interdisciplinary Learning examination reading material on April 3 and are working with it now. The Science and Language teachers are equally preparing the students using this material for the main examination. Teachers will also use all accessible on-screen past papers to help students prepare during this period. professional performance of Music, Dance, and Drama presented by CAC staff, all focused on specific traditions across the entire nation. The student performance was a great success enjoyed both by audience members and the students themselves. It is sure to be a memorable trip for all! The boarding community had a special dinner for the D2 boarders on Thursday evening in the dinning hall. This was followed by a highly emotional time of speeches and appreciation from the students and the boarding parents. Friday was the last day of D2 classes and the whole school had a clap out session for them. They celebrated by having lunch at the pool among other events. The D2 students now have a week of private study before starting their formal written exams on 27th April. During the study week, teachers are available to assist the students as needed. Boarders may remain in school but are expected to keep to normal school expectations, or they may choose to travel home for the study week if they wish. Boarders staying in school that weekend will NOT be allowed to attend any unsupervised parties. If boarders do want to attend, they can only do so if their parents agree and they have been taken out of the school’s care by staying with another family for the weekend. Even if you have already indicated on the Parental Consent form that your child may sign out to friends at weekends, we would like to further confirm that it is acceptable on this particular weekend. If you have children intending to sign out for this weekend, could you please contact us with that confirmation? 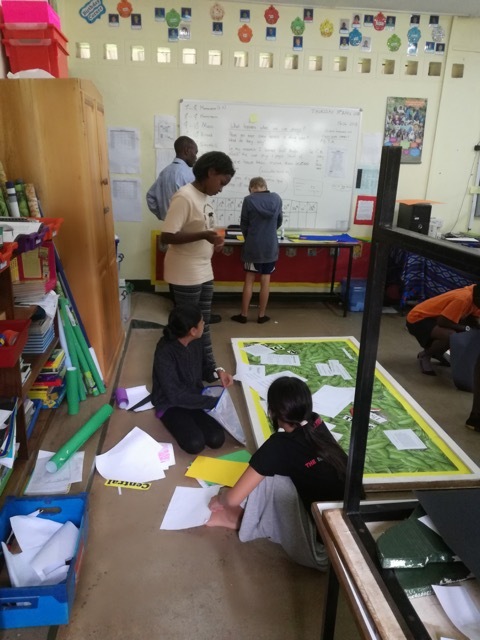 You may contact either the boarding parent or Mrs Bango on rosemarybango@ed.ismoshi.com by whatever means is most convenient (telephone, letter, or email). Boarders will be expected to remain in school for the weekend if we have not heard from you before MONDAY, MAY 14th. We would also suggest on this occasion, that you contact the host family directly to discuss what you feel would be appropriate arrangements, curfew etc for your children on the evening of the party. We do not in any way wish to curtail the students’ opportunity for well-deserved celebration on these occasions, but we are concerned for their safety and their parents’ full consent and understanding. All practices will have resumed. Please make sure you attend every practice session. Today our U15 and U19 Netball teams will be back in action at SCIS. This past Tuesday April 17th the ISM Sports Department hosted its annual Sports Awards and Dinner. It was a fun event. Congratulations to all the teams for a great sporting year, as well as to those students who were selected respective teams’ MVP, MIP and Coaches Choice award recipients. Also, big congratulations to the following 5 students who were selected as ISM Special Award winners. This week the P6 Exhibition Groups have been digging deeper into their inquiries by organising field trips for research or interviewing experts. They have started to have an impact on the wider community by carrying out PYP actions, e.g. organising extra lunchtime football matches to help us keep healthy and creating and sharing an educational Powerpoint about online safety. 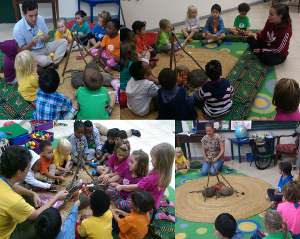 The EC children have been enjoying listening to stories around their makebelieve campfire. 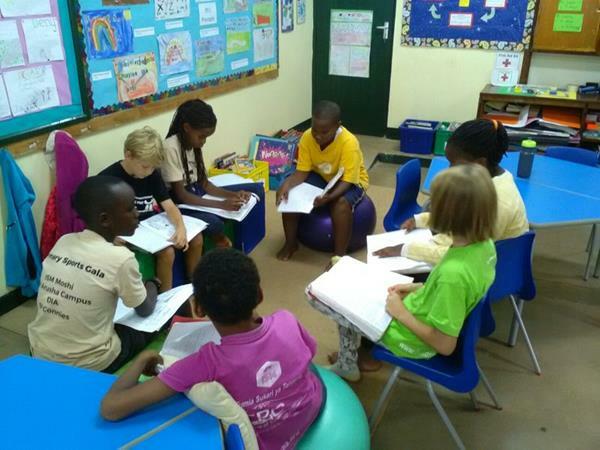 The P1 – P5 classes have been carrying out unit related PYP actions and preparing for their summative assessments. On Friday the P1/2 Class were excited to learn about camping. They also walked down to the Karanga River to find out how the local people benefit from our natural environment. Reminder: We hope to see lots of families helping us create the ISM Community Garden; starting at 11am this Sunday (Earth Day). Meet behind where the ISM buses are parked. Wear Wellington Boots and old clothes which can get muddy. Bring garden tools and seeds to share if you have them. 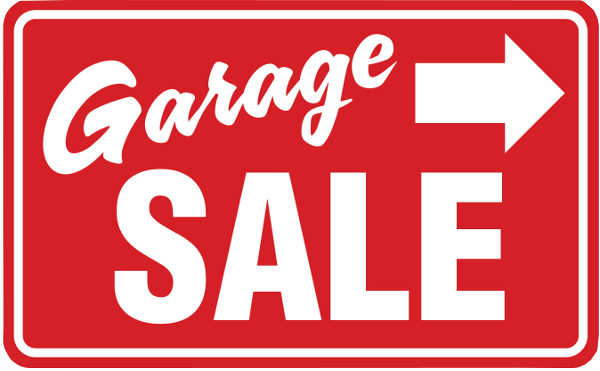 Bring a picnic lunch or purchase some barbeque food. Children can also enjoy the treasure hunt, face painting and games. Reminder: Thursday is a public holiday for Union Day and there won’t be any lessons. Hadithi, Hadithi. Hadithi njo, utamu Kolea. Thanks to our storytellers for this week. Each took the best seat by the fire and told stories of learning and transformation. Congratulations to our EC story-tellers for their creativity and bravery on Friday. Next week we look to the story archetype Voyage and Return in which our character leaves for a distant and strange land and returns with new knowledge. Like our children’s time in EC perhaps? Think Alice in Wonderland, The Wizard of Oz or the Adventures of Peter Rabbit. Our art-form will be books and our learning attribute Inquirer. The children will access our library at the end of the week to try to independently locate books that fit the archetype. In maths they will look at counting up and down to 20 and begin to count in 10’s to 100 and back. We’ll be finding out about the Tin Man, who will help us to remember the difference between an ‘n’ and a ‘u’ and an ‘m’ and a ‘w’! 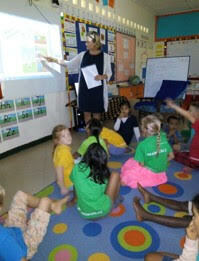 Mama Jasmijn visited us Thursday morning and challenged us to reduce, reuse or recycle our waste. She shared some insightful ways of getting rid of waste and I am sure the children have already started challenging you all concerning this. They will definitely be asking you further questions this coming week as they work on their homework. The rains had everyone nervously wondering whether our day camp would go on. Thankfully it went on as planned. Tents were set up in the classroom in the morning as it continued to drizzle outside. Stories were told as the children rested in their tents. By the time the children ate their snacks, the rain had stopped and off we went for our walk down to the river. An exciting day camp indeed. The children will be reflecting and writing about their adventures next week. This week has been a very busy one for the P2/3`s. They have worked very hard on their summative assessment for this unit and written their first summative rubric. They had a creative Thursday morning working on a space themed art project. Thank you to the mother of Kairi for coming in and sharing her expertise. The amount of research the P2/3`s have done has been amazing. They have shown dedication, enthusiasm and eagerness to develop their understanding of independent topics. Next week we begin our final unit. The children will be inquiring into the following: Water is essential for life on earth. Next week’s homework will be to research into the importance of water. In Math we will be looking at volume and capacity. The children will be reviewing estimation and rounding number to the nearest tens, hundreds and possibly thousands. 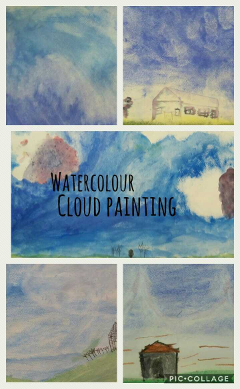 In reading we will continue our interest groups and writing we will be making our own Important book which will focus around water. This week we got right into taking good quality notes. We were able to use materials available and use tables of contents to examine how authors organize content and applied this skill to our own work. We divided up the work in our unit work so that we could research the topics we chose. We are learning to dig deep and inquire about how our topic impacts the world. Next week we will look at what humans can do to prevent such extremes of weather. The students should be watching/listening to local news to bring in any examples they can to aid our learning. We invite any parent who wants to share an experience they have had living through a natural disaster or extreme weather event to come in and share it with the class. In math we have been plotting weather on graphs and exploring right angles in our environment. The P5 students have had a very productive week. They have been practicing using a protractor to measure angles, revising the properties of shapes and creating shape art. In our unit of inquiry sessions the children have been learning how to debate a given topic (see photo: “This house believes politicians should be old because they have more experience,”) and have been reading biographies of political figures. They have looked at examples of street art and considered how it can be used as a vehicle to protest against human rights abuses. Please note that Thursday is the Union Day holiday. I hope the children enjoy themselves and I look forward to seeing them back in class on the Friday. This week has been all work and very little play and it has paid off. I would like to thank all the parents that were in this week, your help has made a great difference in helping us move forward with organising and displaying work on the boards. Earth Day: The Plastic Warriors Exhibition group will be presenting some information during the assembly on Monday 23rd April, as their focus on plastic pollution ties in directly with this year’s theme. Parents you are welcome. In the coming week, the students will be working on the synthesis of their information and assessment tools. They are also encouraged to practice presentation skills which we have been working on throughout the year. Parents you can support your child at home by asking them questions about their issue and if they are not aware, help them find out. This will boost their confidence in preparation for their Exhibition presentation days.